This is helping me avoid more physical therapy appointments as well as helping me get through the day pain free. This worked great for my husband. 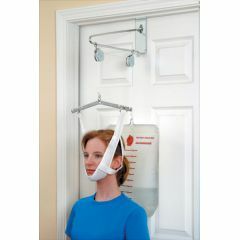 It relieved the pressure in his neck and he can now function. Works just as expected.Great product. I need the chin strap portion of the Delux Overdoor Traction Set (# 198188). All other parts are in good working order. Can I order a chin strap? I lost the instructions and don't know how to string the rope through the pulleys. Could someone copy/scan their instructions to me. I be very grateful. Thanks. does this unit support the right and left jawbone area as it appears to do in the picture? I have TMJ along with the compressed cervical spine.